Thirty years have rolled by since the Millennium turned, India has bulldozed its way to the number three spot in the world economy, overtaking Japan 2030. Now its sights are firmly set on the top spot, as China and its ageing population lose steam. and the US declines steadil y. Eventhough the US retains some sort of lead in a few fields like financial services and R&D, pretty much everything else has passed to the two Asian giants. Most of the world's goods have a "Made in China" or "Made in India" stamp on them. These goods are moved from factory to consumer on some of the world's biggest's ships. The Malacca-max container ship will be over 450 m long, 300,000 DWT of deadweight and have a draught of more than 20 m. These behemoths will each carry up to 18,000 TEUs and be the conveyors of a major portion of the world's trade. This scenario is not hard to imagine given the explosive growth both in India's trade and the size of container ships. Already, the world's biggest container carrier has a capacity of 11,000 TEUs. 2050 is way off, but this gives us a chance to step into the realm of imagination and think of a few innovative if extreme ways to expand Vizhinjam. Today, geography and the presence of heavily populated or tourism areas around it limit the size that the port can achieve. At full capacity, the port will be able to accomodate 12-15 ships and have a capacity of 6.5 million TEUs, which is only 25% of what Singapore or Shanghai handle today. Statutory Warning: Leave your logic and "are you crazy?" questions somewhere safe before you indulge in the rest of this article. 1. String of Ports: This is possibly the easiest strategy to implement and is based on models implemented successfully in major ports like Singapore and Los Angeles. Here, multiple harbours form the port, like Singapore has Jurong, Pasir Pajang, Keppel and so on. Different harbours in the same port can handle different types of cargo based on their draughts or they could handle the same type. Most of the world's biggest ports often adopt this approach as one harbour is seldom big enough or deep enough for indefinite expansion. In the case of Vizhinjam, it is flanked by several ports. The most evident are Colachel in Tamilnadu and Thangasseri near Kollam. Colachel has a draught of about 12 m and is often referred to as a competitor for Vizhinjam as a transshipment terminal, especially due to the interest shown by the current Union Shipping Minister. However, Colachel - once a part of Travancore and the scene of Maharaja Marthanda Varma's triumph over the Dutch - may not be able to compete with Vizhinjam in terms of draught. Neither can Thangasseri which currently has a draught of around 5 m.
The process of transshipment involves the movement of containers from big "mother-ships" to smaller feeder vessels which can access shallower ports. Mother-ships need deep ports like Vizhinjam to dock in but the feeder vessels don't. Even shallower ports like Cochin (current draught 10.2 m) can accomodate them. Herein lies the basis for the multiple harbour strategy. Assuming Vizhinjam can tie up with Thangasseri and, much easier said than done, Colachel, feeder vessels can dock at these two ports while Vizhinjam handles only the giant mother-ships. Assuming that 50% of the capacity of Vizhinjam is taken up handling feeder vessels which will now be freed up, the capacity of the port can be effectively doubled, to about 13 million TEUs. But the two satellite ports will be about 70 Kms from Vizhinjam, how will they become integrated and how can containers unloaded at one port be loaded without much delay at another? The answer is pretty simple - a dedicated Rail Corridor. Twin rail-lines running from Kollam to Colachel. Containers can move between the ports in less than two hours and using an integrated container management system will make the entire harbour-plus-rail system seem like one port. Moving a container off a ship, storing it, retrieving it and loading it on another ship will seem like it is happening within one harbour rather than across two harbours 70 Kms apart. Of course, there remains the small matter of building the rail corridor and getting our neighbours in Colachel to agree, but it can be done with today's technology and geography. And if this works out, minor ports like Kayamkulam can also be roped in to accomodate feeder vessels. 2. The Lakes option: Some of the world's leading ports have made use of existing bays and lakes, and this could be another avenue to expand the capacity of Vizhinjam. There are two candidates which immediately suggest themselves for this role - Vellayani and Kadinamkulam lakes - both of which are a few kilometers from the port. Vellayani is close to the port site and can be linked to the sea by constructing a short canal to it. The lakes have a depth of around 2 m on average and this can be dredge to about 8 m to permit feeder vessels to enter. 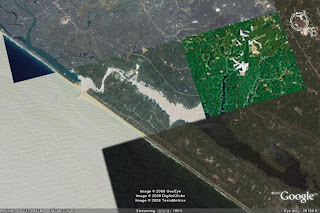 In the case of Kadinamkulam, the lake already opens to the sea, so the estuary only has to be widened and deepened. Containers can be moved among the ports using dedicated rail links as in the earlier option. In the case of Kadinamkulam, water transport of containers is a real option since the old canal - recently renovated - extends from the lake all the way to Kovalam. 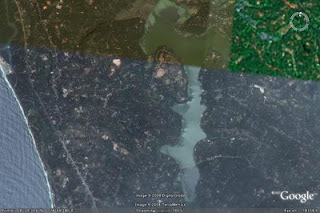 And north of Kadinamkulam, the waterway extends first to Varkala, then to Kollam and finally to Kottapuram near Cochin. This will eventually extend all the way to Manjeshwaram. This means that cargo from across Kerala can be brought to Kadinamkulam and thence to Vizhinjam, and vice-versa using cheap water transport. This strategy will also help to roughly double the eventual capacity of Vizhinjam by moving feeder traffic out of the main port. The technology is also readily available. In fact, it is said that the legendary, far-sighted Dewan of Travancore, Sir C.P. Ramaswami Iyer envisioned creating a port by linking Vellayani lake to the sea. The downside of this idea would be the ecological impact of the massive dredging on the lakes as well as the complete commercialisation of two lakes which would be future tourism destinations and potential water sources for Trivandrum city. 3. Going Offshore:If it becomes impossible to find space for expanding Vizhinjam on or along the shore, then we might have to look somewhere that is being looked at by many of the world's massive infrastructure projects - the open sea! That is not exactly where one would expect to find airports, ports or whole cities. Well, think again. Two of the world's biggest airports - Kobe's Kansai International and Hong Kong's Chek Lap Kok - are built out at sea, as is China's biggest port - Yangshan. Not to mention the cities being created off the coast of Dubai in the form of the Palm Islands. Mankind is becoming increasingly more confident in reclaiming land from the mighty ocean, something pioneered by the Dutch hundreds of years ago. This could be the ultimate future plan for Vizhinjam's expansion. The projects mentioned above have used the technique of reclamation of land wherein either soil from the shore or material dredged from the bottom of the sea is dumped on a patch of sea-bed till it breaks the surface and becomes a patch of solid land. This may be difficult in Vizhinjam due to the depth of the water and the likely ecological impact. For example, the giant Yanshang container port near Shanghai is nearly 30 Kms offshore but is built in only about 13 m of water. Even 5 Kms off Vizhinjam, the depth will be close to 50 m or more. The amount of material needed to build up a large artificial island at this depth will be colossal, putting even the Palm Islands to shame. The answer could be to copy what the oil industry is already doing. The biggest tankers in the world, the so-called supertankers, cannot be accomodated in many ports (Vizhinjam wouldn't bat an eyelid about taking one of these behemoths). So most supertankers are loaded and unloaded out at sea at offshore terminals. These can either be platforms just like oil-rigs or can be floating structures called Single Point Moorings such as the one off Vyppin, built by KRL because the Cochin Port was too shallow to accomodate big tankers. For an offshore container terminal of the type that could be used in Trivandrum, the platform model can be adopted. A long platform built out at sea will act as the Quay alongside which the ships will dock and on which the massive quay cranes, characteristic of container terminals, will move around. Unlike Tangshan which has a much greater area at its disposal, the Trivandrum Off-shore Container Terminal will not be able to stack more than a few containers on it, as any increase in deck area would mean a major increase in the cost of the supporting structures. So once a container is unloaded by a quay crane, it will be dropped onto a pallet and immediately whisked away on a high-speed transfer system, across a long bridge and to a stackyard ashore. The container will be tracked all through its transfer using RFID technology and it makes little difference whether the stackyard is right next to the quay or 5 Km away. An ideal choice for the high speed container transport system could be a cargo monorail or even a maglev. The entire terminal will have wave-shields fitted to mitigate wave impact on the ships during rough weather such as during the monsoon season. While the offshore terminal is the most futuristic of all the concepts that we have looked at, it is clearly possible even with today's technology. And it has the capability to enable Vizhinjam to match and even to beat the likes of Singapore, Hong Kong and Shanghai. To those of you who have been patient enough to persist with my ravings this far, a big thank you! Normally, I never deviate too far from the pragmatic aspect of development, but once in a while it pays to let fly your imagination and dream aloud. Truth often evolves in ways that fiction may not even visualise. After all, if I had told an audience 25 years ago that we would be building airports, ports and whole cities on the sea, there is more than an even chance of me having shared a cell with you-know-who at Arkham Asylum. And today, we don't even bat an eyelid at those same miracles, so let's dare to dream big for Vizhinjam and who knows.....?! Excellent,keep it up.If only the authorities concerned had half the the kind of ruminations you expressed. Good effort man...May be some of these ideas will be realized by 2050. Whatever there is no shadow of doubt that this port is going to script a new chapter in Trivandrum's history..
Ajay, new look is good and your ideas are running wild now, but yes, in the right direction. I support your multiple port strategy. well on the Tangaserri port, it hvnt taken off yet. my home is just a km from the site and during my last vacation , dad said, it haven't taken off due to protest from near by fishermen and also public in general. They don't want trucks moving around with containers, will loose sleep, you know!!.. I could just laugh.. what else can be said..
well on Vizhinjam, if it even becomes half the size of JNPT, Kovalam and even Varkala will be destroyed .... guaranteed. the concept of larger ships doing cross oceans while the feeders do the distribution is becoming popular. but y do u need to dredge all the lakes in kerala? at the most only 10% of port loads will be kerala centric. so need for 10m canals for the whole length of kerala doesn't seems to fit in. but yes, kolachel and tangaserri is important for vizhinyam port's long term success, if the business plan is based on ships with more than 10m depth.. dedicated rail /road corridors to vizhinjams massive hinterland stretching upto kollam and kolachel. These corridors will be critical in de-congesting vizhinjam, ideally all feeder ships should dock only in kollam and Kolechel,and transhipment happens through the corridor. Such a huge port, means it will engulf the entire districts or Kollam and Trivandrum, let alone parts of Tamil nadu. 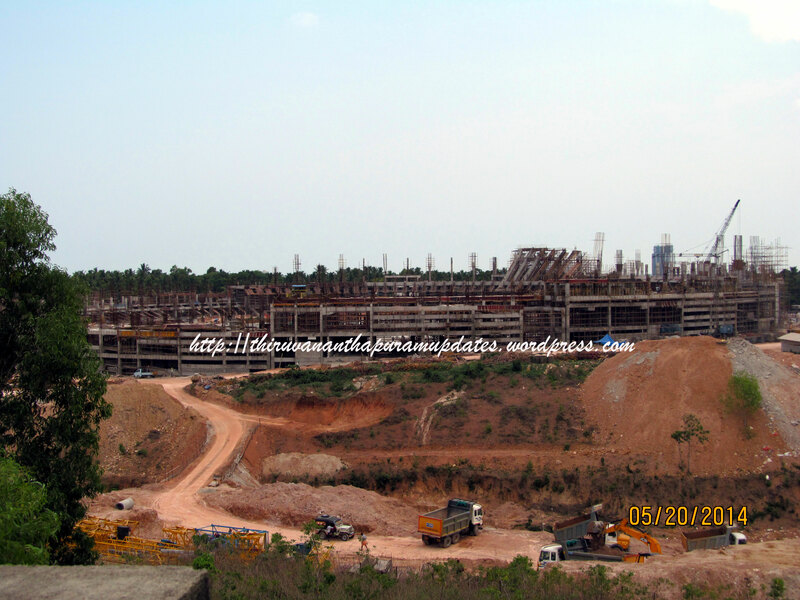 Supply chain demands will require the major container managers including the government owned CONCOR to acquire massive tracks of land in the thickly populated areas of Trivandrum and Kollam, land tracks of minimum 500 acres each. Will our LDF or UDF goverments bite the bullet to help build such a port by relocating lakhs of people? Bigger challenge will be the change in lifestyle, the relaxed malayali having tender coconut and discussing international politics at the bedi kada will suddenly be surrounded by super huge cranes, trucks and aggressive people..
Companies and contractors who wont heed to nota kuli, and our poor atimari thoyulali will have to start working in a port that runs on delivery efficency, not votebank. As the current revenue sources for labor community and the so called vote bank dries up ( there wont be much cocunut trees to climb or individual houses being build or small markets), they will inevitably have to take up jobs with the port and allied industries which wont give them the current liberties like 80 + hartals an year. So the underlying fact is, none of the left wing political parties will be really interested in effecting this change, as it will nullify the reasons for thier very own exsistence. Some time back, one of my very senior uncles said, Communism and marxism thrives only in economicall backward and poverty ridden regions. As people grow up the value chain, their association and liking for communism also reduces. Well there are a few idiots (so called idealist) and another few cunning ( pro communist industrialist) that exsist for very obvious reasons.